Today, we have more from the 1967 film 1999 A.D. This clip shows the way children of the future will learn. 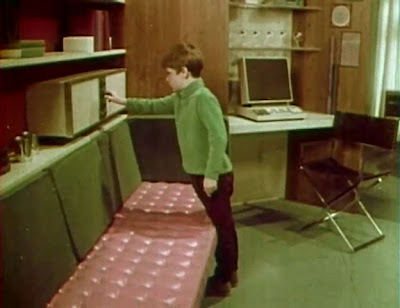 The personal computer, audio lectures and computerized testing are demonstrated. The concept is strikingly similar to the "Answer Machine" of 1964 we looked at a while back. You can find 1999 A.D. on the DVD Yesterday's Tomorrows Today, released by A/V Geeks. 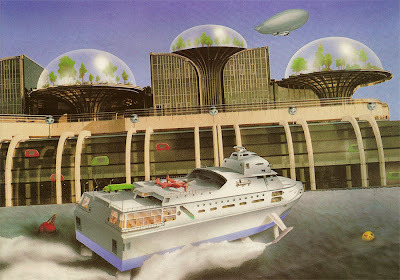 The 1985 book The World of Robots contains this image of a future city. Complete with domes, personal transport vehicles and apparently robots at the wheel. The caption to the illustration appears below. As city life grows more complex and crowded, the need for large-scale control of environment and equipment will demand robotic hands at the helms of trains and boats and planes everywhere. 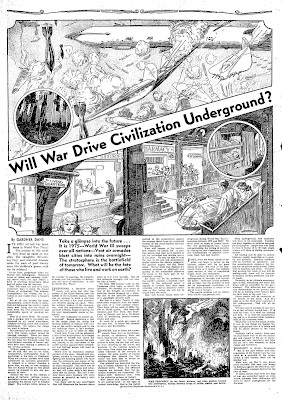 Jim Rasenberger, author of America, 1908 wrote a fascinating piece for the January, 2008 issue of Smithsonian Magazine. As Rasenberger contends, in 1908 it seemed that anything was possible. An excerpt appears below. 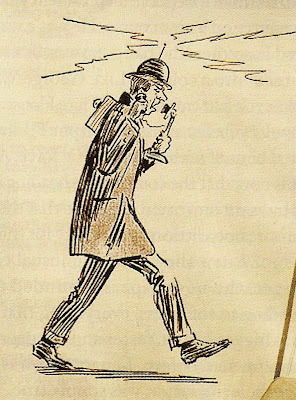 The illustration of a man with wireless telephone is from Harper's Weekly. The year 1908 began at midnight when a 700-pound "electric ball" fell from the flagpole atop the New York Times building - the first-ever ball-drop in Times Square. It ended 366 days later (1908 was a leap year) with a nearly two-and-a-half-hour flight by Wilbur Wright, the longest ever made in an airplane. In the days between, the U.S. Navy's Great White Fleet sailed around the world, Adm. Robert Peary began his conquest of the North Pole, Dr. Frederick Cook reached the North Pole (or claimed to), six automobiles set out on a 20,000-mile race from New York City to Paris, and the Model T went into production at Henry Ford's plant in Detroit, Michigan. 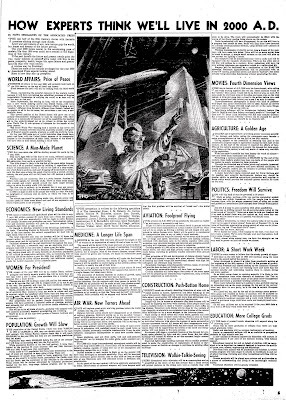 The December 27, 1950 Robesonian (Lumberton, NC) ran an Associated Press article titled, "How Experts Think We'll Live in 2000 A.D." The article covered the future of movies, commercial flight, space travel, medicine and women, among many other topics. Can you believe that by the year 2000 a woman may be president of the United States? Apparently not. Some highlighted predictions of the piece appear below. A transcribed version of the article in its entirety can be found on my other blog, Older Than Me. - Third dimensional color television will be so commonplace and so simplified at the dawn of the 21st century that a small device will project pictures on the living room wall so realistic they will seem to be alive. The room will automatically be filled with the aroma of the flower garden being shown on the screen. - The woman of the year 2000 will be an outsize Diana, anthropologists and beauty experts predict. She will be more than six feet tall, wear a size 11 shoe, have shoulders like a wrestler and muscles like a truck driver. She will go in for all kinds of sports – probably will compete with men athletes in football, baseball, prizefighting and wrestling. - Wireless transmission of electric power, long a dream of the engineer, will have come into being. There will be no more power lines to break in storms. A simple small antenna on the roof will pick up the current for lighting a house. - The Third World War - barring such a miracle as has never yet occurred in relations between countries so greatly at odds - will grow out of Russia's exactly opposite attempts to unify the world by force. - The telephone will be transformed from wire to radio and will be equipped with the visuality of television. Who’s on the other end of the line will seldom be a mystery. Evey pedestrian will have his own walking telephone – an apparatus by a combination of the X-ray and television. Electronic appendectomies will be performed with an X-ray-TV camera, projection screen and electric “knives” – the latter actually being electrodes functioning without puncturing the skin. - In 2000 we shall be able to fly around the world in a day. We shall be neighbors of everyone else on earth, to whom we wish to be neighborly. - The nation's industrial and agricultural plant will be able to support 300 million persons 50 years from now - twice the present population. Land now unproductive will be made to yield. Science will steadily increase crop production per acre. Technological, industrial and economic advances will give the American people living standards eight times as high as now. - Public health will improve, especially the knowledge of how air carries infections, like the common cold, from person to person. Before 2000, the air probably will be made as safe from disease-spreading as water and food were during the first half of this century. - Space platforms, sent out from earth, will end mid-century’s “iron curtain” era by bringing the entire globe under constant surveillance. - Combination automobile-planes will have been perfected. - People will live in houses so automatic that push-buttons will be replaced by fingertip and even voice controls. Some people today can push a button to close a window – another to start coffee in the kitchen. Tomorrow such chores will be done by the warmth of your fingertip, as elevators are summoned now in some of the newest office buildings – or by a mere whisper in the intercom phone. - Radio broadcasting will have disappeared, for no one will tune in a program that cannot be seen. Radio will long since have reverted to a strictly communications medium, using devices now unheard of and unthought of. - Some movie theaters of A.D. 2000 may be dome-shaped, with ceiling and walls arching together like the sky. These surfaces would be the “screen.” Most action would still be in front of you, as now. But some could be overhead, some at the sides, and some even on the wall behind. A little girl steps into a street in the action before you – and you turn around and look behind you to see if an auto is coming. - Through the extended use of better plants and animals, improved fertilizers, new growth regulators and more efficient machinery, it should be possible, leaders say, for farmers to produce future crop needs on much less land than today. - Some see us drifting toward the all-powerful state, lulled by the sweet sound of “security.” Some see a need to curb our freedom lest it be used to shield those who plot against us. And some fear our freedom will be hard to save if a general war should come. - So tell your children not to be surprised if the year 2000 finds 35 or even a 20-hour work week fixed by law. The piece was written by the following specialists of The Associated Press: J.M. Roberts, Jr., foreign affairs; Howard W. Blakeslee, science; Sam Dawson, economics; Dorothy Roe, women; Alexander George, population; James J. Strebig, aviation; David G. Bareuther, construction; C.E. Butterfield, television; Gene Handsaker, movies; Ovid A. Martin, agriculture; Ed Creagh, politics; Norman Walker, labor; David Taylor Marke, education. 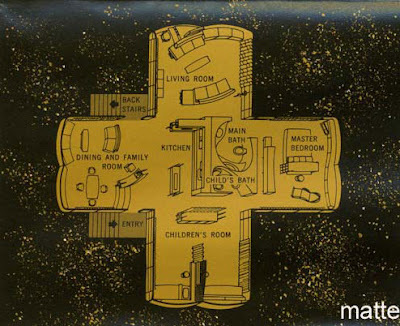 The excellent Disney blog Stuff from the Park has scans of a 1960s brochure for the Monsanto House of the Future. The piece explains that, "The erection of the Monsanto 'Plastics Home of the Future' at Disneyland in the summer of 1957 provided a practical demonstration of the almost limitless potential of plastics in structural applications." Much like the article on the future of glass we looked at last week, this piece centers around selling consumers goods which are positioned as "futuristic." Insert reference to The Graduate here. "Atoms for Living Kitchen" featuring micro-wave cooking and ultra-sonic dishwashing. Telephones with preset and push-button dialing, "hands-free" speakers and transmitters, and viewing screen to see the person who is calling. Modular bathrooms with lavoratory, tub, walls and floor molded in units. Foamed-in-place rigid urethane plastic foam for insulation and structural strength and flexible urethane foam for cushioning furniture and rugs. Climate control center which filters, cools, heats and scents the air in each room independently. Foam-backed plastic floor covering with controlled resiliency and noise-reducing properties. "Acrillan" acrylic fiber and Chemsbrand nylon for upholstery, draperies and carpeting. In his 1986 essay titled, "The Home of Tomorrow, 1927-1945," Brian Horrigan describes the shift of emphasis to gadgets inside the "house of tomorrow," rather than the homes themselves. The essay can be found in the book Imagining Tomorrow: History, Technology, and the American Future. An excerpt appears below. Although, like the public at large, American corporations ultimately refuse to underwrite a future full of modernist mansions or mass-produced homes, they were attracted by a shinier side of the Home of Tomorrow coin: the house as a wonderland of gadgets. It is not surprising that the companies that associated themselves most readily with the Home of Tomorrow were the major manufacturers of electrical appliances. General Electric exhibited a "House of Magic" at most of the major fairs of the 1930s. Alleged to "walk and talk," the house was not really a separate structure but a gimmicky update on the department store "demo" home, a kind of stage set on which glamorous women were cast as housewives, running the household machinery and making a sales pitch. Westinghouse, not to be outdone, built an entire "Home of Tomorrow" in 1934 in Mansfield, Ohio. It was intended as a lived-in laboratory in which the company's engineers and their families would temporarily reside to test the equipment. This house, a tour de force of household electrification, was designed to attract attention, which it did quite effectively. Designed by architect Dwight James Baum, the house was a conventional wood-frame and stucco structure, only slightly odd in style - a sort of Regency-Cubist affair, employing virtually none of the already notoriously "futuristic" modern vocabulary. Indeed, architecture was quite beside the point, according to the Westinghouse engineer responsible for the house. "A new profession of 'house engineers,'" maintained Victor G. Vaughan, "will soon absorb all architectural functions except those of a purely aesthetic nature." The engineers had a field day with the Westinghouse prototype, providing a connected electric load equal to that of 30 average houses, "ready to do the work of 864 servants with the flip of a switch." Some of the features of the house were air conditioning, an electric garage-door opener, automatic sliding doors, an electric laundry, 21 separate kitchen appliances, burglar alarms, 140 electrical outlets, and 320 lights. All this was available, or so it was claimed for around $12,000. Westinghouse admitted that the price would probably place the house beyond the means of most families in the future, thus further removing this spectacular exercise from the democratic rhetoric of the prefabricators. It was a year ago today that I started the Paleo-Future blog. With that first post I warned of my smarmy, cynical attitude toward the future. I still believe everything I wrote in that first post so out of laziness, my first blog post appears below. And I sincerely thank you for reading. I first came across the word "Paleo-Future" in a Flickr group of the same name. However, the topic first sparked my interest when I visited Walt Disney World's EPCOT Center, (now Epcot), and realized that Disney's version of the future was based upon what they thought the future would look like in the 1980s. As is important when depicting the future, your opinions must change with the times, unless you happen to be omnipotent, which means you have no need to revise your vision of the future and have probably used your powers for such noble endeavors as guessing my weight at the local carnival or writing horoscopes that tell me, "you should find time for yourself tonight." While I might poke fun at the outlandish ideas of 1950s America, corporate puffery, or Jules Verne I do it with an admiration for the idealism we seem to be losing in our post-modern society. The belief that technology has the potential to improve the lives of everyone on Earth seems rare. Just remember that an optimism for the future and the attempt to better the world for all humanity is hidden somewhere within each sarcastic comment about flying cars and space farms. In that same vein, I will always remember that the dystopian societies depicted by George Orwell or Alan Moore are just as plausible if we surrender freedom in the name of security. Here's to a "great big beautiful tomorrow." You can listen to an interview I did with Virginia Prescott at New Hampshire Public Radio here. 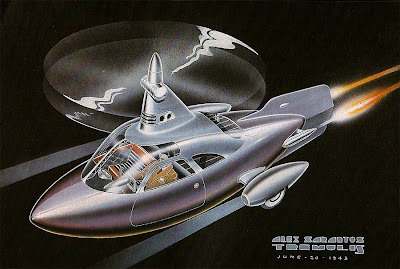 This 1943 rendering of a personal helicopter by Alex S. Tremulis appears in the book Yesterday's Tomorrows: Past Visions of the American Future by Joseph J. Corn and Brian Horrigan. The caption from the book is below. This concept for a high-speed personal helicopter was an early expression of what would become in the years immediately after World War II an extremely popular vision of the future. To many observers, the helicopter seemed to promise wings for city dwellers who might land atop their apartments or office buildings. Unfortunately, helicopters were - and remain - difficult to fly, relatively unsafe, noisy, and energy inefficient. The December 11, 1958 Chillicothe Constitution-Tribune (Chillicothe, MO) quotes Smith Rairdon, director of marketing for Owens-Illinois Glass Company, about the future of glass. His quotes appear below. "In the year 2008 a bride will be carried over the threshold of a glass house. Her kitchen may be glass-walled with a glass refrigerator, glass chairs, shelves and cabinets. "She'll cook with throwaway glass containers which she plucks from the supermarket shelves, uses as cooking utensils in an electronic oven and then places on a dining table as serving dishes." According to Rairdon, more glass will go into walls and roofs than ever before, as well as into clothing fabrics, household curtains, rugs and other furnishings. He chose the year 2008 because it will be the 400th anniversary of this country's first industry - a small glass plant in Jamestown, Va. 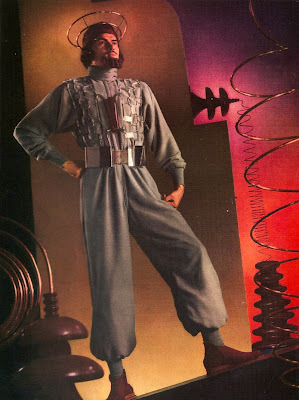 The February 1, 1939 issue of Vogue ran this photo of the 21st Century man. The caption appears below. 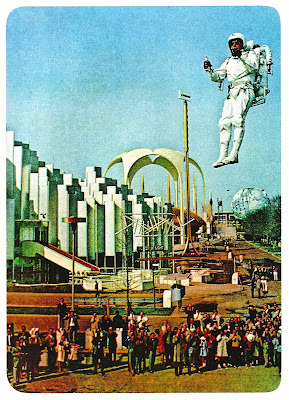 The picture can also be found in the book Exit to Tomorrow: World's Fair Architecture, Design, Fashion 1933-2005. Gilbert Rhode banishes buttons, pockets, collars, ties. The man of the next century will revolt against shaving and wear a beautiful beard, says the designer of boilers, pianos, clocks, and metal furniture. His hat will be an an antennae - snatching radio out of the ether. His socks disposable, his suit minus tie collar and buttons. The November 8, 1970 Chronicle-Telegram (Elyria, OH) ran an article titled, "Computersville is almost here." The entire piece appears below. NEW YORK (UPI) - In Computersville this day, Jane Doe presses buttons on the mini-computer in her kitchen. She orders up a week's worth of low-calorie menus. Within micro-seconds, the machine devises such meal plans. Then it prints them. Before she entered the kitchen, Mrs. Doe stopped briefly in the living room to admire the family's newest possession - a huge geometric print, drawn by computer. As she goes about her chores, she is relaxed by the sounds of her favorite record, Computer Concerto. This features a musical score created by computer and orchestrated by computer. The sounds are electronic. There are blips and beeps and modulated static. At times the sounds blend noises of a dozen jets waiting on the runway to takeoff. Altogether, it is a pleasant record. In the afternoon, Mrs. Doe goes to her small town's medical center for her annual physical. Among other things, she has an electrocardiogram - administered by technicians, processed by computer and read, of course, by computer. The printout on her eletrocardiogram: "Non specific T-wave changes. Possibly borderline gram. Probably within normal limits." All of these things from the world of computers were seen at an unconventional convention in New York - the 25th National Conference of the Association for Computing Machinery. They will come home to roost in the not-too-distant future. You probably won't have to wait until the year 2,000, for example, to have computer art and music in your home. Hospitals of the land already are experimenting with diagnosis by computer. The menu - planning computer for the kitchen, while a bit expensive around $10,000, is available. It is designed to help keep track of financial records, lend a hand with the children's homework - and perform many other tasks. After Radiohead's Amnesiac was released, friends and I would joke that their next record would be nothing but airplane noises. I would actually be interested in hearing that Computer Concerto record. 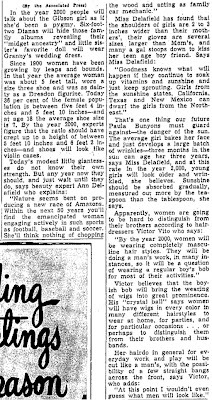 The March 5, 1959 Daily Mail (Hagerstown, MD) ran an Associated Press piece titled, "Thomas Quotes Max Factor On The Woman Of The Future." Factor predicts, among other things, the extensive use of cosmetics by men of the future. The entire article appears below. HOLLYWOOD (A.P.) -- Fifty years from now, a woman of 50 will be just as alluring as a girl of 20. That is the fearless prediction of Max Factor, head of the cosmetics concern that is celebrating its first half-century. "When my father started the company in 1909, women scarcely used cosmetics at all," he commented. "They pinched their cheeks to give them color. The only ones who painted their lips were women of questionable repute or theatrical types - and there was little distinction between the two. "The movie stars helped us spread the use of makeup. As the stars became popular, the public copied their dress and grooming. "Gradually, the use of makeup became almost universal among women. Now girls start wearing it at 14 or younger instead of waiting until they are 18." What about 50 years hence? "People will be living longer. When we started in business, the life expectancy was 40 years or so. Now it is in the 70s and it will go higher. People will want to avoid the lines and sags of old age as long as possible. "I firmly believe that in the future women of 50 years or more will look as appealing as girls of 20. We are keeping in touch with scientific experiments in Europe on youth-giving cosmetics." Factor also foresees the extensive use of cosmetics by men 50 years from now, and for the same reason; to keep young. Men who live longer will want to work longer; hence they'll need to avoid looking aged. Among the Factor predictions: A pill which will forestall the graying of hair. Alpha, the Mullard robot appeared as a publicity stunt at the London Radio Exhibition of 1932. Alpha is seen holding two of the company's thermionic valves, the forerunners of the transistor. 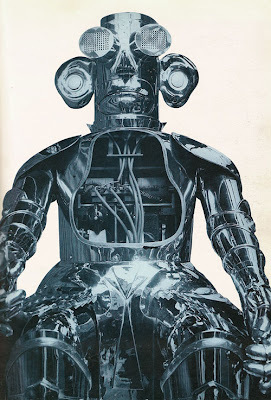 This image appears in the book, The World of Robots. 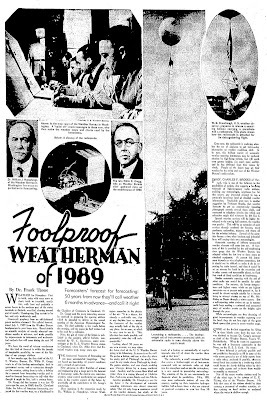 The September 17, 1939 Montana Standard (Butte, MT) ran an article titled, "Foolproof Weatherman of 1989." Excerpts along with the article in its entirety appear below. My apologies to Pittsburgh. Weather for November: First to tenth, rainy with some snow or sleet; tenth to twentieth, mostly fair, with frost and probably a severe freeze in the northern part of the state; twentieth to thirtieth, unsettled, clearing toward end of the month; Thanksgiving Day certain to be fair and only moderately cool. Guesswork prophecy from an old-fashioned patent medicine almanac? 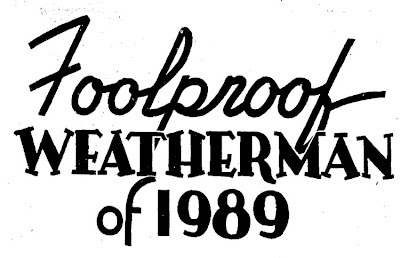 No: official forecast, dated July 1, 1989 from the Weather Bureau headquarters in your home state. Based strictly on scientific analysis of exactly observed conditions months in advance, and made possible by improvements in instruments and mathematical methods that will come during the next 50 years. We have the word of veteran weathermen that this kind of forecast is within the bounds of imaginable possibility, to come in the lifetime of our younger children. A few months ago, the then chief of the U.S. Weather Bureau, Dr. Willis R. Gregg, wrote to all the leading meteorologists, both in government service and in universities throughout the country, asking them to take a holiday for a moment from the forecasting - to tell what they thought it might be like, half a century hence. The article goes on to describe the push-button future of weather forecasting. Looking ahead 50 years on our own account, we may vision the future chief of the U.S. Weather Bureau sitting in his laboratory. A screen is on the wall. He pushes a button, and sees a clear sky above the smoky pall of Pittsburgh (or maybe there won't be any smoke above Pittsburgh by then). He pushes another, and sees clouds scudding over Chicago, driven by a strong northwest wind. Another, and the screen blurs blind white; there is a raging blizzard at Medicine Hat. And so on, across Alaska and Siberia. This concept drawing of the Disneyland ride Rocket to the Moon was featured in the exhibition Behind the Magic - 50 Years of Disneyland and can be found in the book of the same name. The caption appears below. 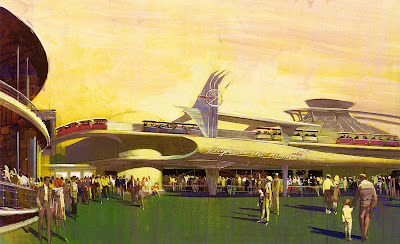 First opened in 1955 as "Rocket to the Moon," this attraction was totally re-designed for the new Tomorrowland in 1967. Unfortunately, because the real moon landing occurred in 1969, it soon lost its popularity and was eventually changed to "Mission to Mars." The September 14, 1930 Syracuse Herald (Syracuse, NY) ran a piece about the people of 1980 who may stumble upon the 1930 film Just Imagine. At the time this article was published the film had not yet been released. The entire article appears below. Hollywood, Sept. 13. - New Yorkers of 50 years hence may draw down from the dusty shelves where forgotten movies rest a quaint roll of celluloid dated 1930 and labeled "Just Imagine," and gather en masse to ascertain what prophetic powers, if any, were possessed by a certain trio of gay song-showmen of our day, the Messrs, DeSylva, Brown and Henderson. Should this transpire, that future audience will see a screen musical comedy conception, by 1930 prophets, of what their life, customs and dress would be. Just how good a picture "Just Imagine" will be remains to be seen, but at present it stands out as the most unusual movie idea in Hollywood, one that has not been done before, and that is saying much. Two or three pictures, true, have looked into the future for their settings, but none on so large a scale as this. "Just Imagine" is laid in New York in 1980. Secrecy has surrounded work on the picture, and sets built to scale in a vast hangar miles from Hollywood were used to depict "a metropolis where traffic proceeds on many levels, where boats dock at the feet of 230-story skyscrapers, and aerial traffic has supplanted the automobile. Science has achieved the miracle of reviving a Brooklynite (El Brendel) struck by lightning in 1930. Television long since has ceased to be a novelty, and people have numbers instead of names. There is a marriage tribunal which confers a desired maiden on the most worthy of her suitors, and this supplies the plot. The hero (John Garrick), an ocean air-liner pilot, loves Maureen O'Sullivan, but a newspaper publisher (Kenneth Thomson), wins the tribunal's approval. Garrick, appealing his case, has four months in which to prove his superiority to Thomson - but what can he do? The act that made Lindbergh an international hero in 1927 is just a routine job to him. Then a scientist offers him opportunity to be the first to fly to Mar, to become the Lindbergh of 1980. Of [unreadable] hectic adventures on the strange planet, to which he is accompanied by Frank Albertson (his friend) and Brendel, the stowaway. "Just Imagine," say its authors, is not intended, of course, as serious prophecy, but as entertainment. 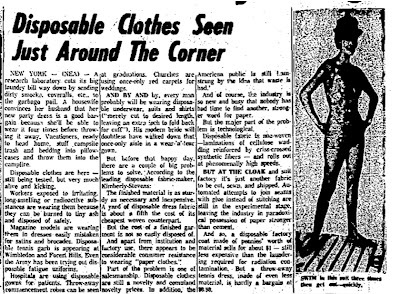 The October 12, 1961 Evening Capital (Annapolis, Maryland) ran a story titled, "Disposable Clothes Seen Just Around The Corner." Excerpts appear below. A research laboratory cuts its big laundry bill way down by sending dirty smocks, coveralls, etc., to the garbage pail. A housewife convinces her husband that her new party dress is a good bargain because she'll be able to wear it four times before throwing it away. Vacationers, ready to head home, stuff campsite trash and bedding into pillowcases and throw them into the campfire. Disposable clothes are here - still being tested, but very much alive and kicking. The article goes on to talk about the American public's issues with waste. Part of the problem is one of salesmanship. Disposable clothes are still a novelty and command novelty prices. In addition, the American public is still hamstrung by the idea that waste is bad. 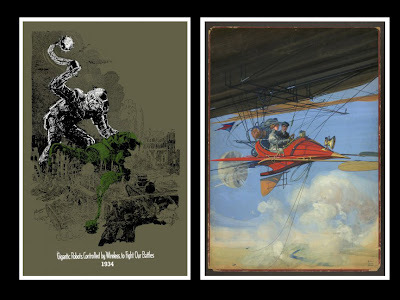 Two new(ish) posters are up at the Paleo-Future Online Store. The first is a new version of the 1934 Gigantic Robots poster. The second is a smaller version (11x17) of the Future Travel poster. The December 13, 1942 Montana Standard (Butte, MT) ran an interesting piece by Gardner Dane about the world of 1975, devastated by war, forcing people to move underground in order to survive. The original article appeared in Every Week magazine. Excerpts, as well as the article in its entirety, appear below. It's 1975! All hell has burst loose in World War Three! The nations of this earth have lined up again on two sides. The slaughter, devastating fury, and material damage make the wars of past history seem like children's games with toy tin soldiers! In an hour, gargantuan cities are blasted into nothingness. Desolated heaps of rubble and smoking, stinking debris mark the spot where a flock of towering skyscrapers lifted pointed peaks into the heavens. Does this mark the end of a city's existence? Does it mean the Grand Climax of civilization? The ultimate Armageddon? The wiping out of a nation as one would crush a hornet's nest? Not at all! For already the keen, dispassionate, incisive minds of scientists are fashioning the world in which many now living will be forced to exist when the next cataclysmic and catastrophic spasm of mankind occurs. Historians, a thousand years hence, will write that after the victory of the Allied Nations near the middle of the twentieth century, there was an attempt to build a war-free world; but after a few years commercial rivalries sprang up again. Then the military leaders of the democracies, with the acquiescence of disillusioned millions, began preparing for the next cataclysmatic spasm of humanity. There will be monstrous airplane carriers of the skies. Gargantuan dirigibles, capable of carrying a hundred fighting and bombing planes, will roam over the continents and oceans of the world. The only effective defense will be more airplanes! Yes, there will be anti-aircraft guns of power and velocity that will make today's fire power seem like toy pistols. But half a century hence giant bombers will carry cannon as powerful as today's anti-aircraft guns! What will happen in the twenty-first century we cannot tell. A century hence, man may have learned to use the unlimited and terrible power of the atom. He may be able to trap the rays of the sun and miraculously render obsolete the electric generator, the gasoline engine and the Diesel motor. Rocket ships may displace the motored airplanes as effectively and quickly as the automobile displaced the horse in the early part of the twentieth century. First, when the black clouds of another war begin to gather on the horizon, nations will lay by great stores of food! Not food as we commonly think of it today, but millions upon millions of tons of dehydrated meats, fruits and vegetables! These millions of tons will be stored underground at strategic and accessible points. Scientists would probably tell us today that the problem of food for an underground civilization will be the easiest problem to solve - if we get at it soon enough. The second problem will be shelter. This will be a gargantuan feat. Deep underground, vast chambers will have to be excavated. Families can keep together in cubicles designed for the purpose. Single men will sleep in tiers in bunks 15 or 20 high; single women will sleep in similar accommodations. All feeding will be done in central kitchens, rigidly controlled as to quality and quantity. Sanitary problems will be handled by specialists. All the accoutrements necessary for living will be moved underground. There will be hospitals and stores. Factories that produce clothes, medicines and other needs. Naturally, in an ultimate emergency such as this, everything and every last detail will be controlled by the government. The abhorred and abhorrent dictatorships of the present time will be as nothing when nations fight for their lives in the next war. But if the past history and total experience of the human race has any value as a criterion of the future, within a half century there will be another war. Each war, we like to say, grows more horrible! But each war brings its defenses against the diabolical, horrible offensive weapons devised by the race of man. 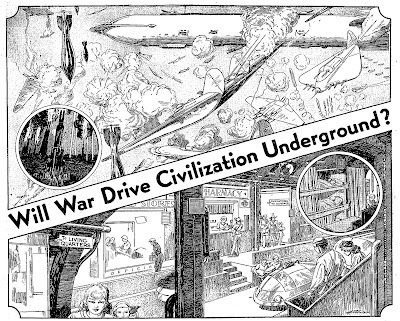 It seems certain that when the dogs of war are unleashed again on some future, unhappy date, civilization will have to move underground for the duration. The September 9, 1939 Syracuse Herald Journal (Syracuse, NY) ran a short piece about the shift from railways to buses as a form of mass transit in New York City. The piece ended on an optimistic note about buses and alternative energy of the future. An excerpt appears below. Doubtless some day the operators will have to meet the problem of increased fuel costs, for consumption of gasoline cannot go on forever at the present rate. But the day seems far distant when curtailment will be necessary - so far distant that no one save a few scientists and government conservation people are giving it any thought. Even should shortage of gasoline develop, say, 50 years hence, it seems wholly probable that some new and economical means of propelling buses will have been discovered by that time. Certain scientists are convinced that in the comparatively near future a method of transporting electrical current by wireless will be discovered which will make it possible to provide buses with power from central development stations. Today we have a color photograph of the GM concept car we looked at back in August. The three-wheeled car was on display at the 1964 New York World's Fair and had a shopping cart which was detached directly from the rear of the car. The color version of this photo is featured in the excellent book Exit to Tomorrow: World's Fair Architecture, Design, Fashion 1933-2005. 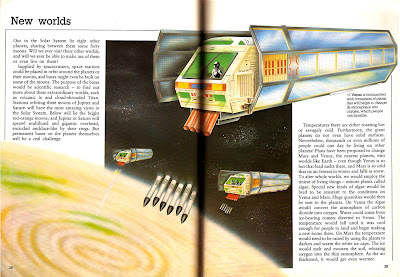 The 1981 book Out into Space (World of Tomorrow) by Neil Ardley features this image of Venus, "bombarded with containers of plants that will begin to change its atmosphere into oxygen, which people can breathe." An excerpt from the children's book appears below. Plans have been proposed to change Mars and Venus, the nearest planets, into worlds like Earth - even though Venus is so hot that lead melts there, and Mars is so cold that its air freezes in winter and falls as snow. To alter whole worlds, we would employ the tiniest of living things - minute plans called algae. Special new kinds of algae would be bred to be resistant to the conditions on Venus and Mars. Huge quantities would then be sent to the planets. On Venus the algae would convert the atmosphere of carbon dioxide into oxygen. Water could come from ice-bearing comets diverted to Venus. The temperature would fall until it was cool enough for people to land and begin making a new home there. On Mars the temperature would need to be raised by using the planets to darken and warm the white ice caps. The ice would melt and moisten the soil, releasing oxygen into the thin atmosphere. As the air thickened, it would get even warmer. We learned a lot from our look at the 1990 Motorola concept video 2000 A.D. 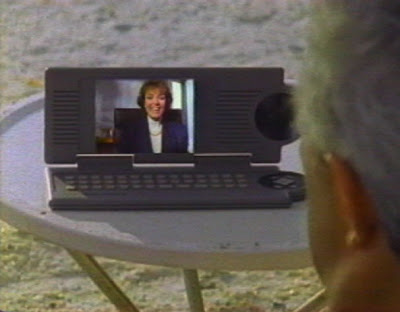 Specifically, we learned that every concept video needs a businessman who must be bothered while on the beach. We learned about the politics of radio spectrum allocation. And we learned about moustaches, don't forget about the moustaches. It seems that American political campaigns start earlier and earlier with each political cycle. However, if you thought the 2008 presidential race started early, check out this article from the April 16, 1908 Cedar Rapids Evening Gazette (Cedar Rapids, IA) titled, "'Count' Opens Campaign for Presidency in Year 2008." An excerpt along with the piece in its entirety appear below. Charles Vaden Barton, "the count," one of the choicest cranks that ever infested the capital, has arrived from Seattle to open his campaign to elect himself president in 2008. He announces that he is the John the Baptist of the millennium, and as he has special arrangements by which he beats the undertakers and cannot die, he can start his presidential campaign a long time ahead and work up sentiment gradually. So he is starting 100 years ahead, and expects that by the time he is elected the millennium will begin coincident with his inauguration. The December 24, 1949 Daily Capital News (Jefferson City, MO) ran an Associated Press article titled, "Authorities Predict Gals Will 'Rise' to New Heights by 2000." An excerpt along with the piece in its entirety appear below. "Nature seems bent on producing a new race of Amazons. Within the next 50 years you'll find the emancipated woman engaging actively in such sports as football, baseball and soccer. She'll think nothing of chopping the wood and acting as family car mechanic." This rendition of a robot from the comic Tillie the Toiler ran in the October 16, 1933 Wisconsin State Journal (Madison, WI).